Phillip Danault is among the best players in Montreal Canadien’s hockey team. Credit goes to Marc Bergevin, the general manager of the Canadiens, for trading the 25-year old from Chicago Blackhawks. This counts as one of the best ever sports move in Canada. Currently, Danault is the best face-off man weighed against his teammates. He is on record for winning up to 53.2 percent of his draws. Danault is the highest defensive center in the team and his responsibility is to help in shutting down the No. 1 line of the opposition. In the last season’s hockey games, he played up to 52 games for Canada and managed to maintain respectable underlying numbers. This season has seen him improve these numbers. The ice hockey forward is the fifth when it comes to the share of shots in the National Hockey League (NHL). He ranks top of the charts because of his brilliance and increased production; not because of on-ice results. The increase in his production began with the goals he has scored per 60 minutes. His result of this season is 2.3 points per 60 which have risen from 1.49 points per 60. The only thing that Danault needs to improve on is confidence because it will enable him to balance both the offensive play and defensive play. He has always been focusing on the offensive play where he is so determined to reach those areas where he can shoot pucks and make plays. 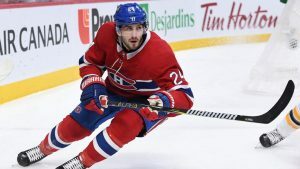 Danault’s role in the Montreal Canadiens is crucial for their success in the NHL. He is doing everything possible to ensure that he fulfills all his responsibilities in the team. Through his efforts, the Canadiens will be more competitive. As young as he is, he has a huge carer ahead of him and he can still improve.